Featherhorn Farm and Chapel Creek Villas have partnered to provide lodging, golf, and hunting excursions for traveling adventurers. With Featherhorn Farm’s endless pursuit to bring you the ultimate waterfowl and outdoor adventure, combined with the ever present southern hospitality and charm of Chapel Creek Villas, we strive to give you that once in a lifetime hunting experience. Reserve your hunt today, as an all day adventure or half day excursion in combination with your golf vacation package. It is 5 am and the air is crisp and cold. The early morning half-light is giving way to a beautiful South Carolina sunrise. The black Labrador retriever is trembling with anticipation. Your camouflaged blind is artfully concealed among one of the many flooded acres of ponds that has been managed just for this purpose. For this moment in time…. And as the darkness fades and those words cut through the morning chill, “NOW!” Your shotgun raises and the sky is engulfed in ducks coming from all angles. As the first shots ring out, the lab leaps and the water is cut like a knife. Before the morning is even underway your limit is reached and your escorted back to a roaring fire underneath an oak tree to survey your mornings bounty. This IS the Featherhorn Experience! Duck Hunts: $300 per person, 4 persons per blind. Includes guide, dog and decoys. Hunts begin 30 minutes before sunrise and end at 10 o’clock. Hunters have the opportunity to harvest: Teal, Gadwall, Mallards, Wigeon, Pintail, Redheads, Canvasbacks, Ringnecks, Greater Scaup, Wood Ducks and many other species of migratory birds. Hunting Licenses & Stamps Required. Gun Rental & Shells Available. 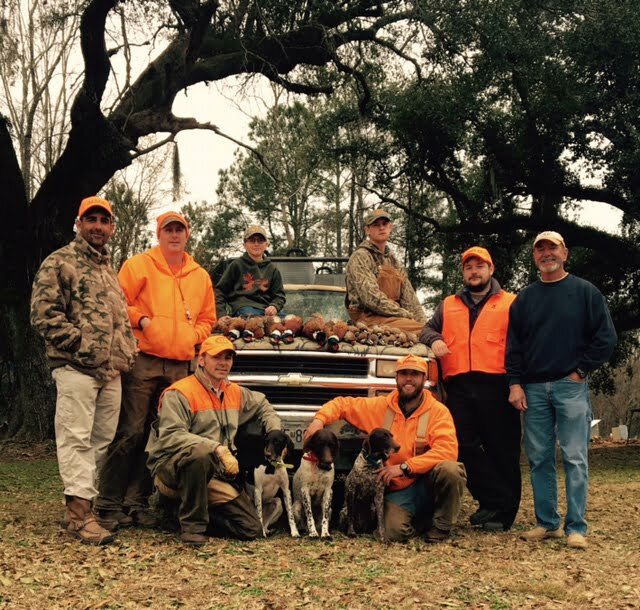 Offering traditional old-south quail hunts sure to satisfy even the most seasoned hunters, add an afternoon Southern Quail Hunt to your Golf Santee vacation. Your hunt will begin at the FHF lodge where you will meet your guide and load into jeeps specifically designed for upland wing shooting. Your guide will drive to the location of the hunt where experienced bird dogs including German short-haired Pointers, English Pointer and English Setter, will be put into the field. Hunters will walk behind the dogs as they chop the fields through pine forests in pursuit of the prince of all game birds, the Southern Bobwhite Quail. Includes Guide and birds processed. Continental Pheasant hunts at Featherhorn Farm offer sportsman the challenging and unique style of European wing shooting just half hour from Santee. Shooters are positioned around Loblollly Pine stand with a rotation system place to ensure hunters enjoy a wide variety of terrain and shot distribution. The continental style hunt offers high volume shooting at a hearty game bird and is perfect or corporate events, client entertainment or entertaining multiple guests. Minimum of 25 shooters required. $260 per shooter includes hunt, birds processed and meal. Add an afternoon of Sporting Clays to your Golf Santee vacation! Only 26 minutes from Santee enjoy shooting clays from a 5 stand course or sporting clays course. 5 Stand Course: 12 stations (different targets), up to 5 people shooting at once. $50 per person, per 100 rounds. Sporting Clays Course: $85 per person, per 100 rounds. Add an Afternoon Hunting Excursion to your Golf Santee Vacation package.